Infinite Art Tournament: At the Movies: "Grave of the Fireflies"
Grave of the Fireflies is an animated film about an orphaned boy struggling to keep himself and his sister alive in Japan in the desperate closing days of the Second World War. They will struggle against firebombing, famine, unsympathetic relatives, unsympathetic strangers, unsympathetic weather, and their childish lack of understanding of just how bad things can get. And things can get pretty bad. The boy will die in the end. That’s not a spoiler; his death is actually shown in the opening scene, the movie mercifully giving away its glum ending so that watchers won’t feel sucker-punched when the credits roll. On the back of the DVD box, I read that Roger Ebert called Grave of the Fireflies “an emotional experience so powerful that it forces a rethinking of animation,” that it is one of totalfilm.com’s twelve greatest animated films of all time, and that it is “universally hailed as an artistic and emotional tour de force.” Indeed, the film certainly did a powerful emotional number on Mrs.5000, who had to request a pause in our home screening due to a crying jag. But then, as everyone knows, Mrs.5000 is a much better person than me. For me, alas, the understanding that I was watching a thoughtful, well-made film was tempered by a sense of impatience for the gloomy, slow-moving thing to be over. I’m afraid I may have looked at my watch a few times. Now this is a bit of a heresy, but I have always felt that animation, with its ability to portray extremes of exaggeration and distortion, is fundamentally better suited for comedy than it is for tragedy. Obviously that’s not an absolute statement, but I think that the intrinsic association of cartoons and comedy is much deeper than many frustrated “serious animators” would care to admit. 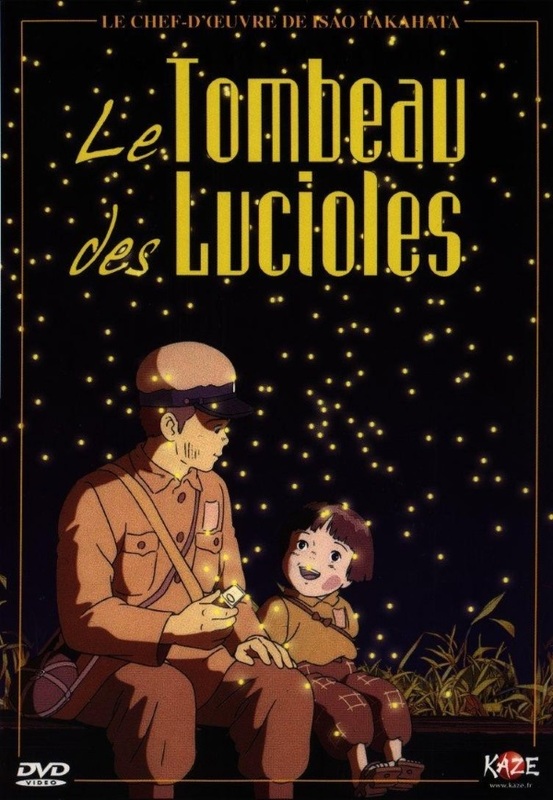 In Grave of the Fireflies, there is certainly much good animation, and the film tells its story clearly and cleanly. At the same time, I repeatedly felt while watching it that I was seeing a moving storyboard for a far more powerful and gritty live-action film lurking somewhere behind the animation. Too, Grave of the Fireflies is a film about the horrors of war. In my college years, I felt that it was a very powerful experience to be shown by a film that war is a terrible thing. I think that my younger self would have found it very validating to be shown a film about the devastation of war, and would have praised this movie very highly in the hope that everyone would watch it, come to share my notion that war is bad, and that the world would thereafter live in peace. At this point of my life, though, I don’t feel like I really need more evidence that war is a socially destructive force. At the movies, I’m mostly looking for stories and imagery. Fireflies delivers on both fronts, to be sure, but what it delivers is a bit broad and just a touch too sentimental. Prognosis: This is a film that is, again, “universally hailed as an artistic and emotional tour de force.” In trying to review it, I feel almost as though I am really reviewing myself, trying to mount an apology for not joining the universal hailing. It’s unquestionably good. Is it great? I didn’t find it great. But I am certainly in the minority.